The moment you create an account you will receive an hero. Your hero can be sent as a reinforcement to other villages like every other unit. However, unlike every other unit, it is possible to control your hero from any one of your own villages at a time. To use your hero from another one of your own villages you must send him there as a reinforcement and tick the "Change hero home town" box whilst doing so. Once your hero arrives at the village you send him to you will be able to control him from that village. The hero skill “strength” increases by 100 points instead of 80 points for each skill point added. 20 % “Cranny dip” (also known as “Plunder bonus”) for all units attacking with the hero. When a hero is created he has 4 skill points that are set to his resource production. Ability levels can be increased up to level 100. Each time a hero gains a level he earns 4 additional ability points that can be used to increase his 4 ability levels. Points put into this ability increase the attack and defence value of the hero. Please note that your hero count as cavalry in case he is equipped with a horse and as infantry in case he is not equipped with a horse. Points put into this ability increase the attack value of the whole army by 0.2% per point (maximum of 20%). This bonus only applies if the hero is attacking with the army. Points put into this ability increase the defence value of your whole army (means all own troops defending - the village where they come from is unimportant) by 0.2% per point (maximum of 20%) This bonus only applies if the hero is defending with the army. Other defending troops which are not under your control, will remain unaffected by this bonus. Points put into this ability increase the resource output of the village where the Hero is located. 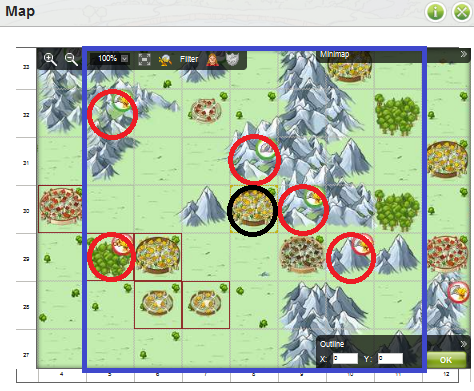 You can opt to increase production of one resource only or to evenly spread the bonus across all resources. It still remains one skill. You can freely change that setting. After upgrading a hero's mansion to level 10, you can use your hero to occupy oases in your surroundings. At building level 10 one oasis can be occupied, at level 15 two and with a hero's mansion level 20 three. The oases you want to occupy have to be within the 7x7 square around your village (please note that your village has to be in the middle of the 7x7 square). The example below marks "your" village in black and the oases you are theoretically able to conquer in red. Hint: You can only have 3 oases per village. Conquering player owned oases is possible, too. You need to have at least one open slot in your hero's mansion. Remember that you have to send your hero along or you cannot conquer the oasis. If the village you are attacking already owns three oases at the time of your attacks the first successful attack will lower the oasis' loyalty from 100% to 0% making it yours. If it already owns two, the attacks only lower the loyalty by 60% and if it already owns one the loyalty will decrease by only 40% in a successful attack. Troops with higher fighting strength values are, of course, better and stronger than troops with lower fighting strength values. The reviving costs of the stronger troops are higher than those of the inferior troops, though. Players can own one hero and every time he dies the player may revive him. How much can a hero carry? - A hero can carry nothing at all. Do heroes show up in battle reports? Can I see the skills of a hero in the battle report? - No, this is impossible. What is the maximum level of a skill? - The maximum level is 100 per skill. Is it possible to defend one village with multiple heroes? - Yes, but the defence bonus only applies to troops of the player who owns the hero giving the bonus. When does a hero lose hit points? - Almost every time you attack someone as the base defence (palace + wall) is enough to inflict at least some damage. Can a hero be used as sole defender or attacker in a combat? - Yes, but this is not advised as a hero will die if he receives more than 90 damage (or loses more than 90 hit points) in a single battle. How is the experience of a hero calculated? - Each opposing dead soldier (experience/exp = upkeep of the dead soldier) in a battle where a hero took part is added as experience. See the table above for a clear listing how much experience/kills you need to gain another level. Does a hero get experience when he dies in a battle? How is the experience divided when there are several defending heroes? - It is divided evenly between the heroes. Example: If there are 3 heroes, each one would get 1/3 of the experience. Does a hero get improved by upgrades done in the smithy? - No, they do not influence a hero at all, regardless of when the upgrade has been done. When can I start occupying oases? - You need a hero's mansion level 10, 15 or 20 for each oasis you want to occupy. How many heroes can you have at a time? - Each player can only have one hero. If this hero dies, the player will have the option to revive it. Can I move my hero to another village of mine and use him from there to attack? - Yes. To do this you need to check the checkbox "Change hero home village" before sending it to the new village. What happens to the skills and experience when I revive a hero? - Apart from the hero having 100% hit points again, he will be the same as before he was killed, he'll lose neither skills nor experience. - It is 10 per day by default. It can be enhanced by items though. Do I still get the items if my hero dies on an adventure? Where can I change my hero settings? - In the right upper corner you see the picture of your hero. If you click on it a page with the hero attributes opens. There you can change your hero settings like the resource production. What kind of unit is the hero treated as? Cavalry or infantry? - The hero count as cavalry in case he is equipped with a horse and as infantry in case he is not equipped with a horse. Do I lose my items if my hero dies? Am I able to name my hero? How can I revive my hero? - If your hero died, just open your hero settings. There you have the possibility to revive him - all you need is enough resources or a bucket to do so. It can be revived by items though. Please note that you can only revive your hero in a village with a rally point. In case you do not have a rally point in the village you try to revive your hero in, the hero will get revived in his former home village. Does a hero's fighting strength count for both offence and defence? What does "Your hero will not defend the village he currently belongs to." in my hero's settings mean? - This means that he will not participate in the defence of the village that he is currently at. However, if you've sent your hero as a reinforcement to another player's village or your own village, he will defend it even though the function is enabled. What is the resurrection/revival time for my hero? My hero always dies. What can I do? - You need to level him in fighting strength to avoid this. Can the items like ointment be stolen from my hero? Is there any way to trade or send items between players or inside the alliance? What do I need to control my hero from another village? - Just send your hero to one of your own villages (make sure you check the "Change hero home village" nox before sending it away). As soon as he arrives there you can control your hero from this village. How is the speed of my hero calculated? Tip: The standard works only between alliance members and the boots work for all targets. If he is travelling between alliance members he gets the bonus for boots AND standard otherwise he will only get the bonus for boots.